This article is meant to be a step by step guide on how to install Ozeki VoIP SIP SDK on your computer. After following this page you will be able to start creating your own VoIP solutions using Ozeki VoIP SIP SDK. Installation is a very important process when you start using a program. The installation of a program is the act of putting the program onto a computer system so that it can be executed. In most cases other things (drivers, plugins) are installed at the same time that are necessary for the program to work properly. Installation usually implies that once installed, the program can be executed again and again, without the need to reinstall before each execution. Installation guides describe the installation process step by step. In some software solutions, when running the install file of a program, these steps are also shown, one after the other. You only need to follow the instructions. Ozeki VoIP SIP SDK is a professional software, and its installation is not complicated at all. This page contains the necessary installation steps to take before start using Ozeki VoIP SIP SDK. The installation of Ozeki VoIP SIP SDK is very easy with the installation wizard. The following screenshots will help you do the process properly. First you need to download the installation files from the download page and unpack it to a temporary folder (Figure 1). Open the folder where you unpacked the installation files and double click on the Ozeki_VoIP_SDK Windows Installer package (Figure 2). 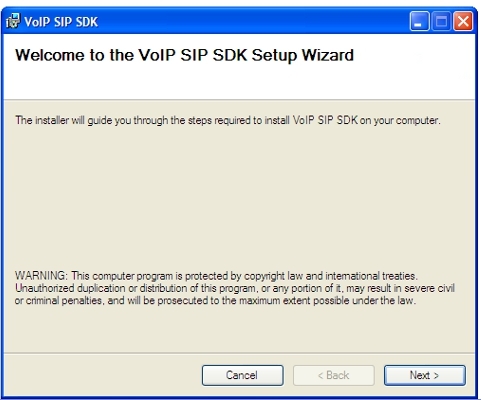 The installation wizard will start with a welcoming page that informs you about that the Ozeki VoIP SIP SDK will be installed on your computer (Figure 3). When you press the Next button on the Welcoming window, you get to another one that will allow you to select the installation folder for your SDK (Figure 4). The default folder for installation is the C:\Program Files\Ozeki\VoIP SIP SDK folder, but you can change this if you wish. If you want to check if there is enough space on your drive for the installation, you can do it by pressing the Disk Cost... button on the window (Figure 5). This will show you the free space for all your disks. If you want to change the target folder for the installation, you can do it with pressing the browse button and then find and/or create the folder you want to install the SDK into (Figure 6). When you selected the installation folder and pressed Next, there is only one step forward before the installation, you need to confirm it (Figure 7) by pressing the Next button. The installation starts with an empty progress bar that shows the process (Figure 8). The installation can take some time according to your hardware configuration (Figure 9). When the installation is complete, the window will inform you about it and you can press Close to start working with the SDK. Now, The Ozeki VoIP SIP SDK is installed on your computer. You can activate it with your activation code or you can try the example programs that were also installed with the SDK. You can find an Ozeki VoIP Examples link (Figure 11). This article demonstrates how to install Ozeki VoIP SIP SDK on your computer.